MailShark Free Sign-up 60 days Per Domain! Another scam email promising the recipient a chance to win a $500 Woolworths gift voucher if they fill out a survey has started up. The email leads to a phishing site, designed to steal the recipient’s personal details and financial information. Figure A shows the email in full, whilst Figure B shows a close up of the more relevant sections of the email. The email relies on marketing techniques that offer free gift cards if the user fills out a survey. As mentioned in previous posts, this technique is not uncommon in online marketing. Because the email masquerades as a marketing email, recipients may not think to check the veracity of the sender or the links in the email. It offers the recipient a chance to win a $500 gift voucher and tells the recipient that the survey is short. The subject line of the email reads “Click the Woolworths logo to enter”, whilst the sender is “Service”. This email is a very convincing looking phish. However, the email does have some signs that it is not legitimate. For one thing, none of the links contained in the email lead back to the genuine Woolworths site. Given that the email is supposed to be for a Woolworths competition, and it is supposedly directly from Woolworths, we would expect at least one link back to the Woolworths site. 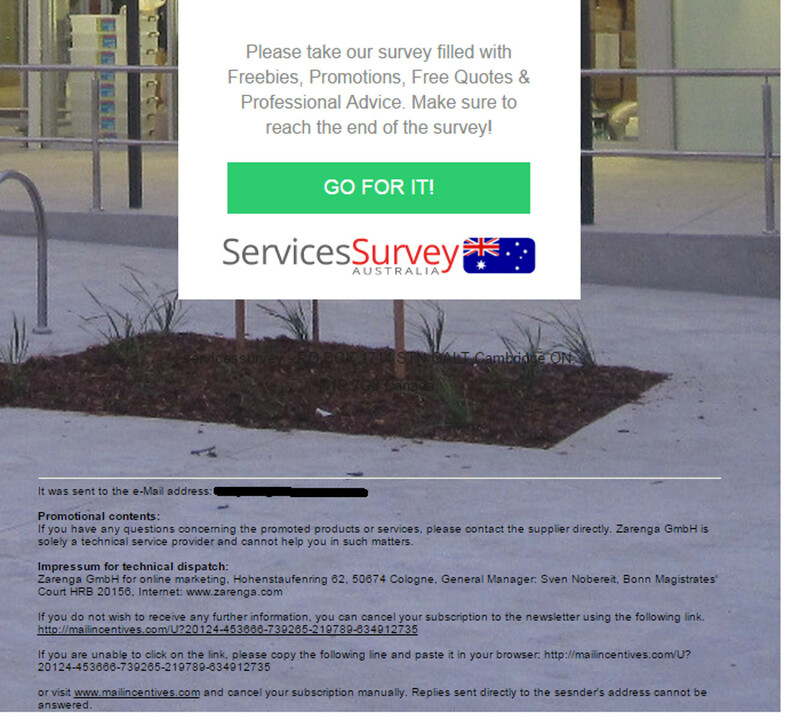 The wording is slightly clumsy in one part: “Make sure to reach the end of the survey!”. Checking on the Woolworths site under their Promotions section shows no such promotion. These emails have been circulating with a higher frequency than usual, again due to the Christmas season. If you receive this email, don’t click on the links. Delete it immediately.